I love Katherine Hepburn. Apparently she didn’t love dressing up. I wonder how she felt about salad dressing? 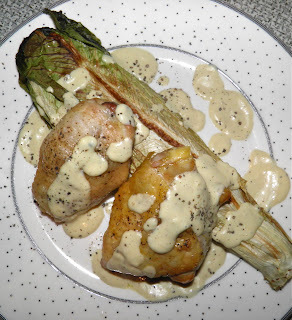 In particular, warm creamy roasted garlic dressing. It sounds a little complicated to make at home, right? It isn’t. A few nights ago we had fajitas. 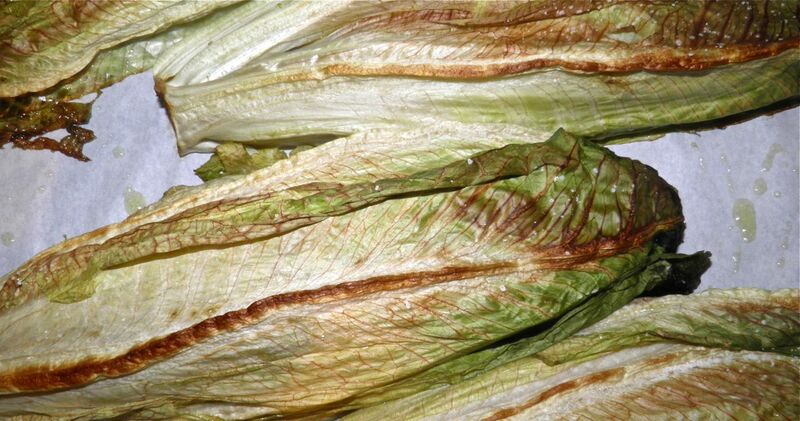 I usually buy one head of romaine for that recipe, but at the grocery they wanted almost $4 for one. $4!!! Across the aisle were packaged romaine hears at 3 for $3.50. Still extortion, but a little better. And I could use the leftover hearts somehow, right? I didn’t want to use the remaining lettuce the same way so I went looking on the inter-web. I found my muse in roasted romaine hearts with caper dressing. Next came the chicken. It, too, was casting me languid looks, but from my refrigerator, not the counter. It had to be used – soon. Who wants salmonella or e-coli, right? If I roasted the chicken thighs – on top of garlic cloves – I could then use the cloves in a warm vinaigrette as a fantastic dressing for both. So that’s where this recipe originated. There are sites on the web that allow you to type in what you have hanging around and give potential recipes. But I find them spotty at best, and often they only give you recipes for what you already know how to make. Not very exciting. When you want something different you have to go out on a limb and try new things. Like roasted lettuce. I had never had roasted lettuce before. It’s not bad, actually. Even better with parmesan and garlic. But, honestly, what isn’t? A bonus is the anticipation. The smell from the garlic will fill your house with a very “homey” aroma. This is really easy. All you do is stick stuff in the oven and then purée the garlic. The result is a heady, delicious dish. 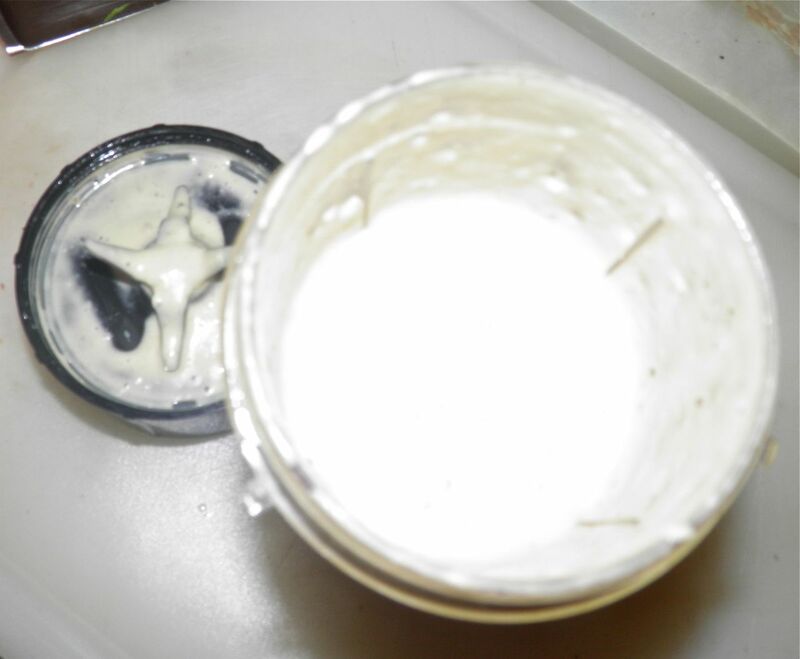 I can see many uses for this creamy, garlicky emulsion. Peel the cloves from a whole head of garlic. Peel and slice the onion into thin rings. Arrange both in the bottom of a 9x13 oven-proof pan. Drizzle with about 1 tablespoon of the olive oil and add the white wine. 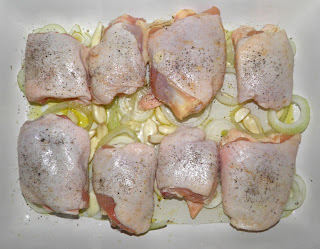 Place the chicken on top and sprinkle with salt and pepper. Place the pan in the preheated oven and promptly turn the heat down to 375°F. Let the chicken bake for 1 hour. Meanwhile, slice each of the romaine halves in two. Drizzle the remaining oil on a baking sheet. Place the hearts in the oil and rub gently to coat. If desired you can line the sheet with apiece of parchment paper. It makes clean-up easier. Sprinkle the hearts with salt, pepper and some grated parmesan (if desired). Bake the hearts for the last half hour of the chicken’s baking time. Remove both hearts and thighs from the oven at the end of the hour. Internal time for the chicken should be 180°F. Place the chicken on the pan with the hearts. Scoop the garlic, onion and any collected liquid from the bottom of the pan and place in a small blender or food processor. Add the Dijon mustard and purée. Next add some olive oil and vinegar (in a 3 oil / 1 vinegar relationship) until you get the consistency you desire. Process until light and creamy. This only takes a few seconds. The dressing can be very thick or thin, depending on your preference. 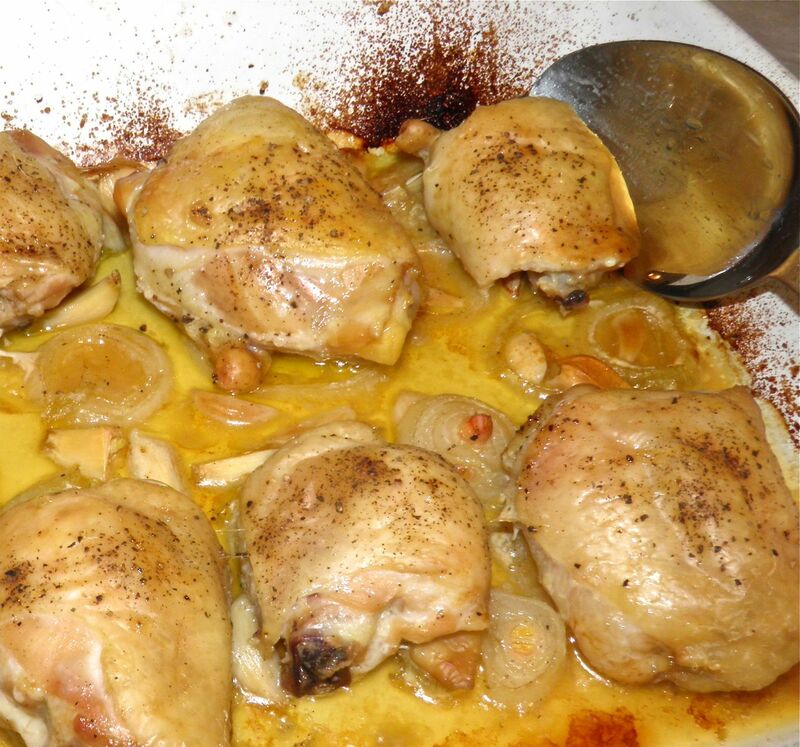 To serve, drizzle the warm dressing on both the hearts and chicken. Grate fresh parmesan on top if desired.